1st Battalion, 5th Marines (1/5) is an infantry battalion in the United States Marine Corps based out of Marine Corps Base Camp Pendleton, California consisting of approximately 800 Marines and sailors. Nicknamed Geronimo, it falls under the command of the 5th Marine Regiment and the 1st Marine Division. The battalion was formed in Mexico in 1914 and has served in every major conflict that the United States has been involved in since then. On 13 July 1914, the battalion was formed at Vera Cruz, Mexico, and sailed for Guantanamo Bay, Cuba for service in the Caribbean theatre. The battalion was disbanded upon their return to Norfolk, Virginia, on 24 December 1914. On 25 May 1917, the battalion was activated and deployed to France on 1 June 1917. 1/5 participated in the following World War I campaigns: Aisne, Aisen-Marne, St. Mihiel, Meuse-Argonne, Toulon-Troyon, Chateau-Thierry, Marabache, and Limey. From December 1918 to July 1919, the battalion participated in the occupation of the German Rhineland. It then re-deployed to Marine Corps Base Quantico, Virginia and de-activated in August 1919. In July 1920 the battalion re-activated to provide security for the U.S. Mail. In March 1927, the Battalion deployed to help stabilize the government against overthrow attempts by rebel forces. For the next six years, they aided the Nicaraguan government until peace was finally restored. 1/5 was deactivated in January 1933. Shortly thereafter the battalion was re-activated in September 1934 in Quantico, Virginia and served in the Caribbean theatre until the outbreak of World War II. In November 1934, the 1st Battalion was reactivated for the fourth time, only to be deactivated in March 1935. Shortly before World War II in April 1940, 1st Battalion was again reactivated. The fighting in World War II found the Marines of 1st Battalion at Guadalcanal, New Guinea, Peleliu, and Okinawa. In April 1946, their mission accomplished, 1st Battalion was disbanded and most of the Pacific veterans returned to civilian life. During October 1949, 1st Battalion, 5th Marines was reactivated in Camp Pendleton, California. During August 1950, the Battalion deployed to fight the Communist force invading the Republic of Korea. Names such as the Pusan Perimeter, Inchon, Seoul and Chosin Reservoir were added to the Battalion's battle vocabulary. At the close of hostilities, the 1st Battalion returned to the United States, settling at Camp Pendleton. From June 1966 to March 1971, 1/5 was deployed to Vietnam. The battalion participated in action around Chu Lai, Danang, Quang Nam, Que Son Valley, Hoi An, Phu Loc, and An Hoa. The unit was deactivated in June 1974 but once again was quickly reactivated in March 1975. The battalion played a major role in the Battle of Hue City during February 1968. Engaging the enemy in the famous Citadel on the north side of the Perfume River, the battalion became known as the "Citadel Battalion". 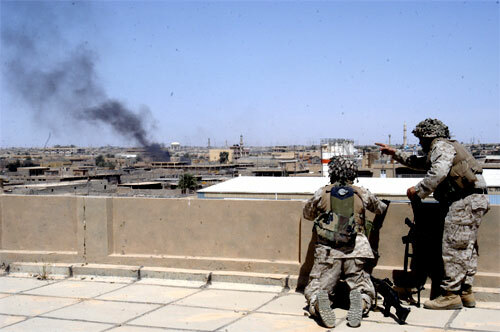 Marines from A/1/5 engage insurgents in Fallujah during Operation Vigilant Resolve on 7 April 2004. From 1987-89, The battalion supported Operation Prime Chance in the Persian Gulf. In August, 1990, the battalion returned to the Southwest Asia in support of Operation Desert Shield, and subsequently took part in combat operations in Kuwait during Operation Desert Storm. The battalion formed the left half of the mechanized Task Force Ripper, along with 1st Battalion 7th Marines, Alpha Company 1st Tank Battalion, Alpha Company 3rd Tank Battalion, HQ 7th Marines and Delta Company, 3rd Light Armored Infantry Battalion. They were supported by Alpha and Delta Companies of the 3rd Assault Amphibian Battalion, 1st Combat Engineer Battalion and a platoon from Charlie Company, 1st Reconnaissance Battalion. The task force was commanded by Colonel Carlton W. Fulford, Jr. and saw considerable combat as it pushed into Kuwait, seized Al Jaber Airfield and consolidated with other Marine forces at Kuwait International Airport of 27 February 1991. Following the cease fire, the task force backloaded to Manifeh Bay and departed Saudi Arabia on 8 March. The battalion returned to Camp Pendleton the following day. Marines with A/1/5 peer over a building top to fix enemy targets in Al Fallujah, Iraq 7 April 2004. The battalion deployed to Kuwait in 2003 to become part of the invasion force that ousted Saddam Hussein. The Marines of 1/5 were the first to enter the country beginning combat operations the day prior to the war beginning. The battalion continued north in the coming weeks before ultimately participating in the battle for Baghdad. They returned again to Iraq as part of Operation Iraqi Freedom in early 2004 for security and stabilization operations in Al Anbar Province. In March 2004, the battalion, this time attached to the 1st Marine Regiment along with several other units, participated in Operation Vigilant Resolve in the restive city of Fallujah. They were deployed a third time in support of Operation Iraqi Freedom, one of only two Marine Corps infantry battalions to do so at the time, in the city of Ar Ramadi, capital of Al Anbar Province between March and October 2005. 1/5 deployed to Afghanistan from May to December 2009 as part of Task Force Leatherneck and conducted combat operations in the Nawa-I-Barakzayi District of Helmand province. 1/5 was once more deployed to Afghanistan from March to October 2011 in support of Operation Enduring Freedom and ISAF to the Sangin District of Helmand Province. During this time they took part in two separate combat operations. Upon completing this rotation they were awarded with the Navy Meritorious Unit Citation award. In September 2012, 1/5 deployed as a Battalion Landing Team (BLT) as part of the 31st Marine Expeditionary Unit. 1/5 completed a six-month rotation including a deployment to the Kingdom of Thailand in support of exercise Cobra Gold 2013. The Battalion was relieved by fellow 5th Marines Battalion 2/4 and returned to Camp Pendleton in late May 2013. Wikimedia Commons has media related to 1st Battalion 5th Marines. ↑ Hlad, Jennifer (9 March 2008). "2/8, other Lejeune units to deploy with 2nd MEB". www.enctoday.com. Archived from the original on 14 March 2009. http://web.archive.org/web/20090314220903/http://www.enctoday.com/news/2nd_62892_jdn__article.html/meb_expeditionary.html. Retrieved 9 March 2009. ↑ completing a six-month rotation including a deployment to the Kingdom of Thailand in support of exercise Cobra Gold 2013. "1st Battalion 5th Marines' official website". http://www.i-mef.usmc.mil/external/1stmardiv/5thmarregt/1-5/. Retrieved 18 June 2008. "Lineage of 1st Battalion, 5th Marines". United States Marine Corps. http://www.i-mef.usmc.mil/DIV/5MAR/1BN/lineage.asp. Retrieved 18 June 2008. "31st MEU website". United States Marine Corps. Archived from the original on 21 June 2007. http://web.archive.org/web/20070621114818/http://www.usmc.mil/31stmeu/index.htm. Retrieved 21 July 2007.